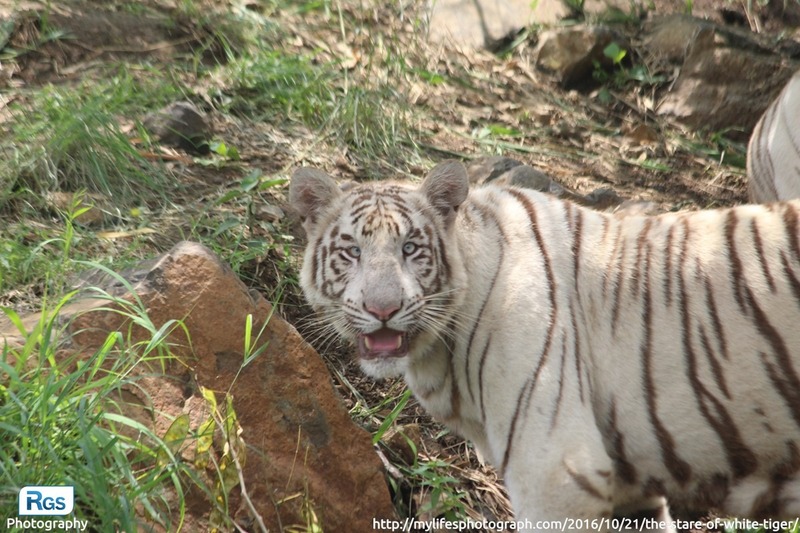 I have captured this white tiger photo at Praduman Zoo Park, Rajkot. If I talk about this park, this park is spread approx. in 137-acre of area. Everyday around 900-1000 peoples are visited the park. This park was opened by the Rajkot Municipal Corporation in 2010. I went there in the Janmashtami Holidays to capture such natural photos and spent some time with family. I captured so many photo over there. Among them, This White Tiger photograph is my favourite one. If I talk about this capture, I spent 10-15 min for this capture. Before few minutes ago, two tigers fighted with each others, so lots of crowd over there. It’s really challenging for me for this capture but at last I finally captured this beauty photo which i shared with you. I also want to share such interesting things about the White Tigers which we are not know. White tigers have blue eyes. They have good swimming capabilities. Night vision is 6x better than a human. It means that they hunt or kill easily as well as in the night. In the last 100 years, only 12 white tigers have been spotted in the wild. The life cycle of the white tigers between 12-20 years depending upon where they are. The 29 July is Global Tiger Day or International Tiger Day. If you want to know more about the white tigers, Visit the following mention link: Interesting Facts About White Tigers . This photo is captured by using Canon 1200D 55-250mm Lense.